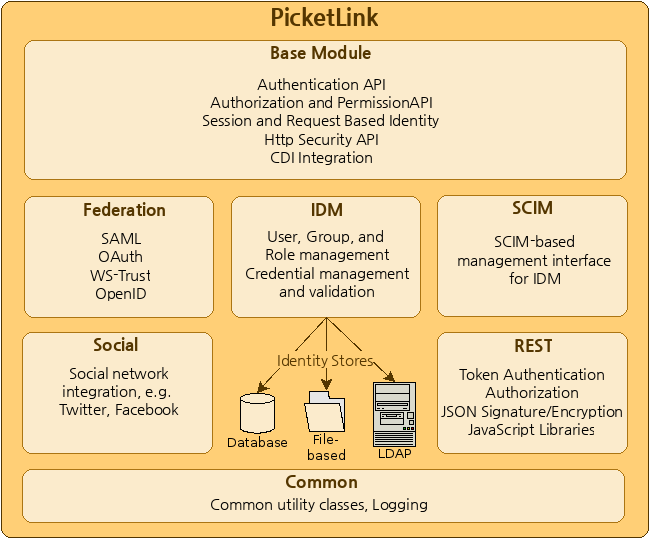 PicketLink is an open source project for simplified security and identity management for Java Applications. Why the name "PicketLink" ? A Picket Fence is a secure system of pickets joined together via some type of links. Basically, the Pickets by themselves do not offer any security. But when they are brought together by linking them, they provide the necessary security. This project is that link for other security systems or systems to bring together or join, to finally provide the necessary secure system. Build model from various data sources such as Databases, LDAP, File System and mix-n-match! Simple API for Users, Roles, Groups and Attributes. Use CDI based application programming. Application developers have greater control for authentication. You use the IDM as the foundation for your authentication needs. PicketLink has a permission model that allows you to have robust access control for your Java Applications. Permission implementations include ACL and Drools Rules based implementations. API allows custom authorization implementations. Easy migration to a fine grained access control model using XACML. Parsers and Object Model available to build robust SAML enabled applications. PicketLink includes login modules for building trusted heterogeneous applications using different application servers including Wildfly Application Server. PicketLink allows you to incorporate Social Login into your applications. You can build applications that allow sign in using Facebook, Google and Twitter. PicketLink allows JavaEE applications to incorporate robust security. JavaEE constructs are supported. PicketLink supports SAML, XACML and WS-Trust. From the very start, PicketLink has been designed with testability in mind. The secret to that fidelity is Arquillian a component model for integration tests that execute inside the real runtime environment. Using Arquillian for development gives you an extremely fast change, compile, test cycle for any component model. This strategy allows you to take Test Driven Development (TDD) further than ever before. Security for your Java Applications does not have to be scary. PicketLink provides lots of quickstarts to get you started quickly. PicketLink has greatly benefited from community feedback, contributions and patches.